Last night around 5:30, we passed through a quiet four way stop, and my husband said, "Whoa!" It was dark, but out of the corner of my eye, I saw a car passing behind us. Me: "What, did that car almost hit us?" Husband: "No, his lights weren't on!" 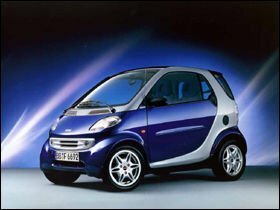 Ironically, it was a little blue Smart Car stupidly forgetting to turn on headlights, driving around Stamford almost invisible to other drivers. You really do need to be on your toes around here. I can't tell you how many drivers seemed determined to sideswipe me as I drove around this weekend. I love those things though. It's between a convertible fourtwo and a bug.